Goal 16 of the Sustainable Development Goals (SDGs) is essentially a rule of law goal. Rule of law is required as a framework to achieve and maintain peace and good governance and is inherent to the achievement of equal access to justice. Access to justice in its broadest sense reflects and encompasses the need to ensure equality, inclusion and accountability in the implementation of all the other SDGs if development is to be truly sustainable. Rule of law creates an enabling environment for development ensuring mechanisms are in place to facilitate access to justice and other development outcomes. 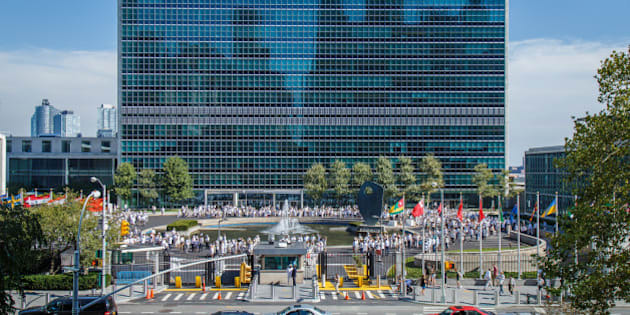 To mark the 70th birthday of the United Nations, UN staff form 'What R U Doing for Peace' at United Nations Headquarters, Sept 17, 2015, New York. While much has been achieved since 2000 when the UN adopted the eight Millennium Development Goals, evaluation of the MDGs has demonstrated that economic growth in itself is not an adequate measure of development or poverty reduction, especially when issues of inequality, discrimination, insecurity and abuse of basic rights prevail. The 2030 Agenda for Sustainable Development "recognizes the need to build peaceful, just and inclusive societies that provide equal access to justice and that are based on respect for human rights (including the right to development), on effective rule of law and good governance at all levels and on transparent, effective and accountable institutions." Rule of law is essential to realizing equitable growth, inclusive social development and environmental sustainability, and ultimately to ensuring that the type of justice envisioned in the 2030 Agenda is truly transformative. Goal 16 of the Sustainable Development Goals (SDGs) is essentially a rule of law goal. Rule of law is required as a framework to achieve and maintain peace and good governance and is inherent to the achievement of equal access to justice. Access to justice in its broadest sense reflects and encompasses the need to ensure equality, inclusion and accountability in the implementation of all the other SDGs if development is to be truly sustainable. Rule of law is also critical as an enabler of the other SDGs. To achieve the proposed poverty-reduction, education, health, environmental sustainability, economic growth, innovation and equality goals, requires four things: legislative frameworks - backed by international law standards and informed by public engagement - that include effective and equitable regulations and implementation mechanisms; capable, inclusive, responsible and transparent institutions to implement the laws; accessible, fair and transparent dispute-resolution processes and reliable enforcement mechanisms; and an empowered civil society able to claim its rights to resources and services, and to demand accountability of those responsible for the implementation of the SDGs. Several SDGs specifically reference rule of law elements in their targets, including Goal 5, which calls for policies and legislation to promote and empower women and girls, and Goal 10 on eliminating discriminatory laws, policies and practices to ensure equal opportunity and reduce inequalities of outcome. Others do not. This is a shortfall of the SDGs. Why? Because integrating rule of law elements and targets into the implementation plans of the SDGs will not only contribute to the achievement of the SDGs, it will also help ensure the outcomes are equitable and inclusive. Rule of law creates an enabling environment for development ensuring mechanisms are in place to facilitate access to justice and other development outcomes. Governance structures operating within a system of rule of law ensure participation, transparency and accountability. Each SDG implementation plan should therefore include the establishment of effective legal frameworks, the strengthening of governance and legal institutions, and the empowerment of communities, including, women, the poor and the marginalized. For example, to achieve Goal 15 on terrestrial ecosystems, laws and regulations are needed to protect ecosystems, regulate acceptable use of these systems, and provide for equitable sharing of benefits. Mechanisms to resolve disputes and enforce decisions based on the legal framework are also required. Regulatory agencies with responsibility to apply and enforce the law and dispute resolution bodies, such as courts, need to be strengthened to apply the laws. Local communities must be empowered to participate in decision-making, protect their rights, and hold the duty bearers (governments) accountable. Canada, with its constitutional democracy, its Charter of Rights and strong independent institutions of governance, has a legacy and culture of supporting international and domestic rule of law. Good governance and rule of law have been recognized as priorities in Canada's international assistance. Canadian institutions and organizations have extensive experience working with partners in developing countries and countries in transition to support rule of law initiatives through peace-building, governance and access to justice projects. The universality of the SDGs means that the Government of Canada has a responsibility to ensure the SDGs are met here in Canada, as well as abroad. While Canada has a strong justice system, Canada has its own challenges. These include the long-term erosion to legal aid systems, where funding limitations currently jeopardize access to justice, and continued inequality, especially for aboriginal and other vulnerable groups. The SDGs also give Canada a context in which to consider the domestic legal frameworks necessary to effectively address issues such as climate change; consumption and production; and developing inclusive, safe, resilient and sustainable cities. Canada can make a difference internationally by sharing its experience in building effective legal frameworks, building strong institutions and empowering citizen engagement in peace and security and good governance called for in Goal 16, and essential to realizing the other SDGs. The access to justice challenges we face in Canada, how we attempt to address them and the lessons we have learned may also usefully inform the achievement of the international access to justice goal both at home and abroad. Jennifer Khor is Project Director International Initiatives for the Canadian Bar Association. Robin Sully is Secretary-Treasurer for the International Commission of Jurists - Canada.